Vue pittoresque sur la montagne Nouveau journal Chalet * 6 et 7ème nuit gratuite! Le tarif de base est de huit personnes et coûte 45 USD par personne et par nuit pour toute personne supplémentaire de plus de huit ans. Entouré d'une nature sereine, ce luxueux chalet en bois rond est une maison de vacances de rêve pour une famille ou un groupe d'amis! - Les clients profiteront d'une vue spectaculaire à 180 degrés sur la montagne depuis chaque chambre! - 7 min à pied de la rue principale - Boutiques, cafés et restaurants! - Seulement 5 minutes en voiture de la station de ski et de tous les magasins dont vous avez besoin! A group of our neighbours rented this cabin for the Family Day Long Weekend. We fit 4 families (8 adults, 9 kids) into Winny's cabin, and never felt crowded. 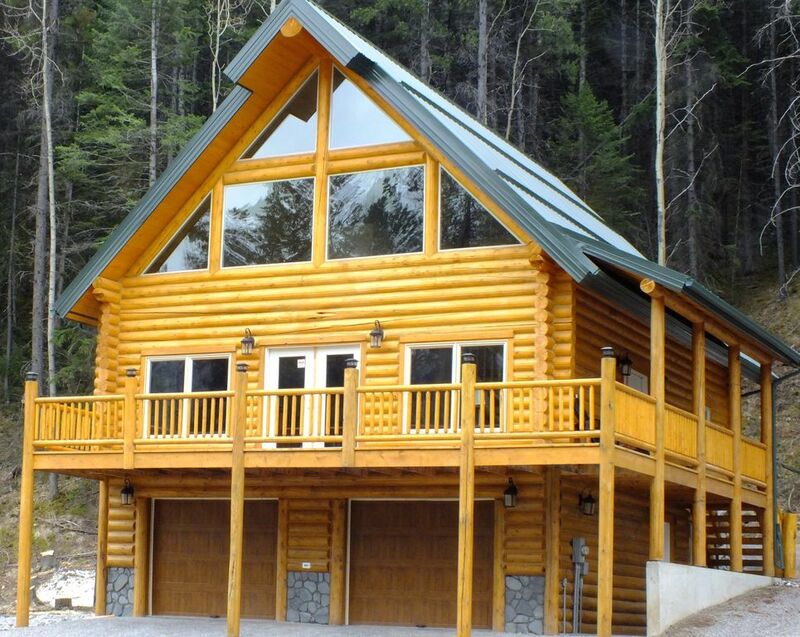 The cabin is beautifully crafted on the top side of a quiet cul-de-sac, moments from mainstreet Blairmore and was an excellent home base for skiing at Fernie and Castle. There is also some great cross-country skiing at Allison recreation area nearby. We even did night skiing at Pass Powderkeg, which is a small local hill right next door. We enjoyed our time here immensely. Winny is an excellent host, and was very responsive to our needs. Thumbs up all around! Thanks for your kind comments you have shared here on Vrbo. We are happy to hear, that your family and friends have enjoyed your time with us. Rest ensured, that we will do everything in our power to be appear clean and modern all times. Please do not hesitate to contact us directly for your next visit . I'd like to offer you a customer loyalty savings of 10%. The house was beautiful and the kitchen was very well appointed. I brought a bunch of kitchen stuff from home because when I have stayed at other VRBOs they often don't have good knives or frying pans but this was unnecessary here. It was a perfect place to have a reunion with old school friends. Perfect home - rustic and sophisticated at the same time. This has become our choice weekend away from the hustle and bustle of everyday life. It is our third year and plan on returning. So well outfitted with all needs met. Wonderful accommodations in a wonderful location. Whole experience could be greatly improved with better communication between host and guests. Beautiful, clean, well-equipped home, great for a large family, plenty of sleeping options, three bathrooms and a laundry room. We loved cooking in the beautiful kitchen and on the gas grill. We watched deer from the porch. We did a lot of driving during our stay, going to Waterton Lakes, Glacier and Calgary. The scenery and wildlife were worth the drive. Thank you so much for your wonderful review. I am happy to hear that you've found us and enjoyed the stay with your family, I appreciate the time and effort you put into reviewing my work. and we look forward to seeing you on your next trip to Crowsnest Pass! Ski alpin, Motoneige, Ski de fond, quading, VTT, observation des oiseaux, pêche, randonnée pédestre ..
Rates are subject to change until reservation is confirmed. Cancellations 60 days or more before arrival are permitted with a $100 cancellation fee. No cancellations permitted 59 days before arrival. Cancellations during this time frame will result in loss of the deposit fee. Balance due at check in. Damage Waiver: registered occupant to sign damage waiver including provision of valid credit card (Visa or MasterCard). Credit card will be charged a security deposit of $500.00. Guests to maintain the property and security deposit will be returned.